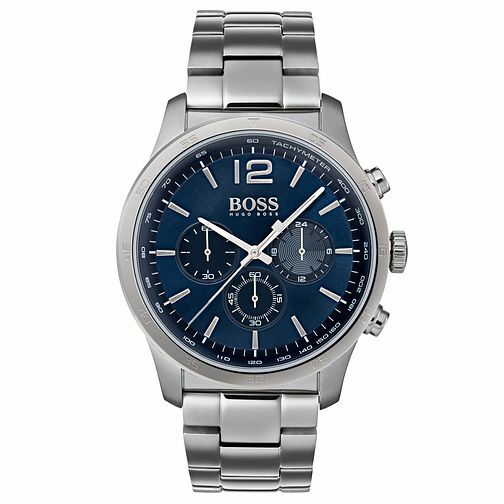 Hugo Boss blends both fashion sense and precise functionality with this chronograph watch, with three separate subdials helping you track subdivisions of time and a bezel that helps you track a minute effortlessly. Styled in nautical blue tones, the bracelet lets you wear the piece more securely for a stylish and efficient timepiece. Hugo Boss Professional Men's Stainless Steel Bracelet Watch is rated 5.0 out of 5 by 1. Rated 5 out of 5 by Anonymous from Boss watch men Very nice watch , Quik service . Nicely packed.quick delivery , very happy with the item .